This is the PocketSprite. At a little over two inches tall, one inch wide and a half inch thick, it’s the world’s smallest playable emulation device. It can run Game Boy, Game Boy Color, Sega Master System and Sega Game Gear games right out of the box. And you can play them, even if you have giant sausage fingers. The PocketSprite is the final form of the tiny Game Boy project hardware hacker Jeroen Domburg showed off at the 2016 Hackaday Superconference. Domburg teamed up with fabrication specialist Steve K to turn the rough, 3D-printed proof of concept from 2016 into the sleek black number you see here. 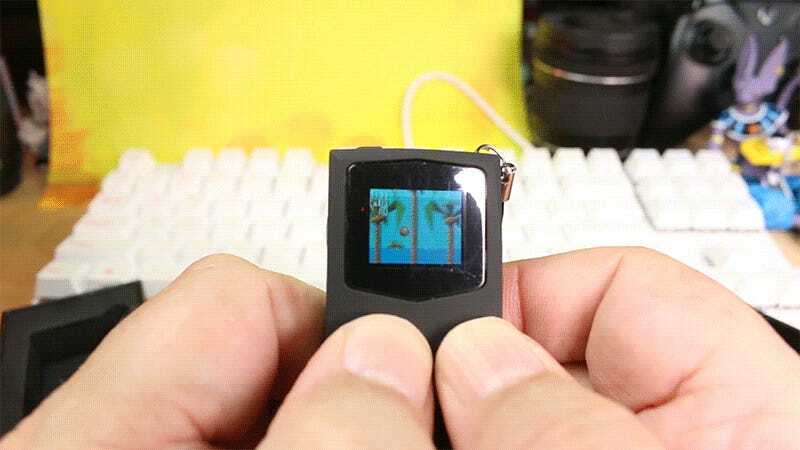 There are other tiny gaming systems out there, but none are quite as powerful as the PocketSprite. Powered by an ESP32 dual-core 240 MHz processor with 512 KB of RAM, it’s more than capable of emulating the 4.19 MHz, 16 KB original Game Boy that inspired its creation. Game Boy Color, Sega Master System and Game Gear games all run quite well, though the 25mm by 22mm display renders all but the largest text unreadable. Despite tiny buttons that are quite easy to manipulate with my massive thumbs, the PocketSprite isn’t a very practical gaming device. Hackers and homebrew enthusiasts might have more fun with it, pushing the limited but capable little machine to its limits. For me it’s a very clever little curiosity, something to pull out at parties and bus stops to astound passersby. If you’re interested in doing either of those things, the PocketSprite is now available for $55 through its Crowd Supply campaign, with an expected ship date of May of this year. It’s by far the coolest thing I’ve had on my keychain.